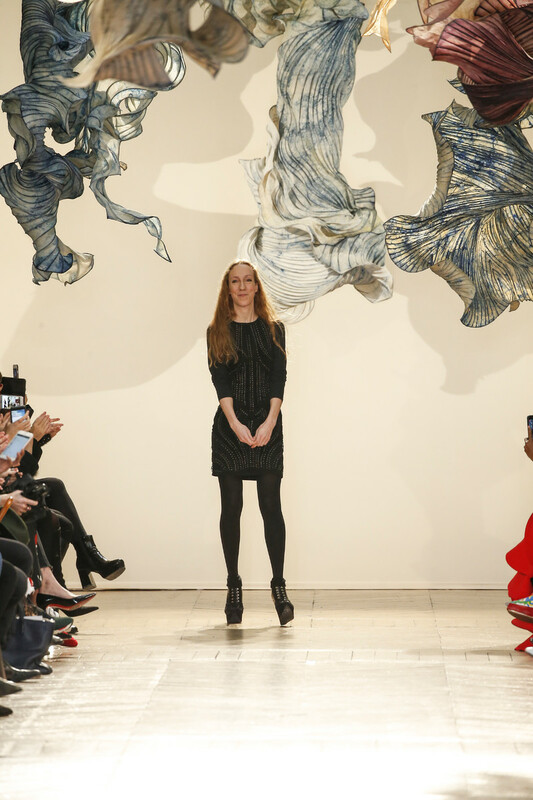 This season Iris van Herpen presented a serene, more wearable collection. Despite the labor-intensive nature of the clothes with the opening Foliage dress requiring 260 hours of 3-D printing and endless other high-tech processes — there was an immateriality to the collection. The designer stuck to classic couture shapes. But the structures looked ultra fragile, with van Herpen focusing on silk-tulle bases covered in geometric formations of laser-cut fabrics, as well as her signature exoskeleton structures. She used as her starting point the aerial photography of Thierry Bornier and Andy Yeung, among others, along with the organic floating paper sculptures of Dutch artist Peter Gentenaar, with a selection of them suspended from the ceiling of the show venue. The final dress resembled a living version of one of his works.